I've begun the process of making identification videos, and embedding them into the webpages. The first is the Ginkgo Nut Page. The videos are also on YouTube, and can be found on the WildFoodsHomeGarden channel on Youtube. It's going to take a good while before every plant has a companion identification video - it is a slow process, and I'm just learning how to do this. Google has been putting pressure on websites to update to HTTPS (secure connection), even if the site has no commerce on it like this one. If the site does not do that, the Google Chrome browser will label it as "Not Secure". I finally updated the whole site, and have to apologize to anyone who tried to use the site on Friday July 27, 2018 if they found the site down. To put it mildly, it was not a smooth transition, but it got done with a lot of help from a few good people. Thank you to everyone who worked on this - especially the great people at Ezoic. There were many weather folk stories passed down in my family from my grand parents. All my grand parents were born between 1884 and 1900, so it is fair to say they came from a vastly different time. One weather predictor that I remember being told many times when I was a child in the 1960's was: When the Spruce trees have an unusually large number of cones at the top of the tree, but little down lower, it is going to be a rough winter. Lots of snow and colder than usual. For some reason, of all the weather predictors, that is the one that really stuck with me. Because of that, I have been watching for it for close to 50 years. In the late summer and fall, I look at all the spruce trees I pass by. I can say with an absolute lack of scientific rigor, that for the most part, it has held true. I will give a wild guess and say that it seems to hold about 80% of the time. I have also listened to what the meteorologists give in their very long term forecasts for the season ahead. Again, with a total lack of scientific protocol, my guess is that they are right about 60% of the time. In my area of Canada - South Western Ontario, last year at this time they were talking about a very rough winter. I used my ancient snowblower a whopping three times it turned out. But, the Spruce trees were saying there was nothing special coming up that winter. The cones were average in number, and normal in spacing on the trees. I know, one year means nothing, but just an example. This year, the Spruce trees are screaming: This one is going to be rough. 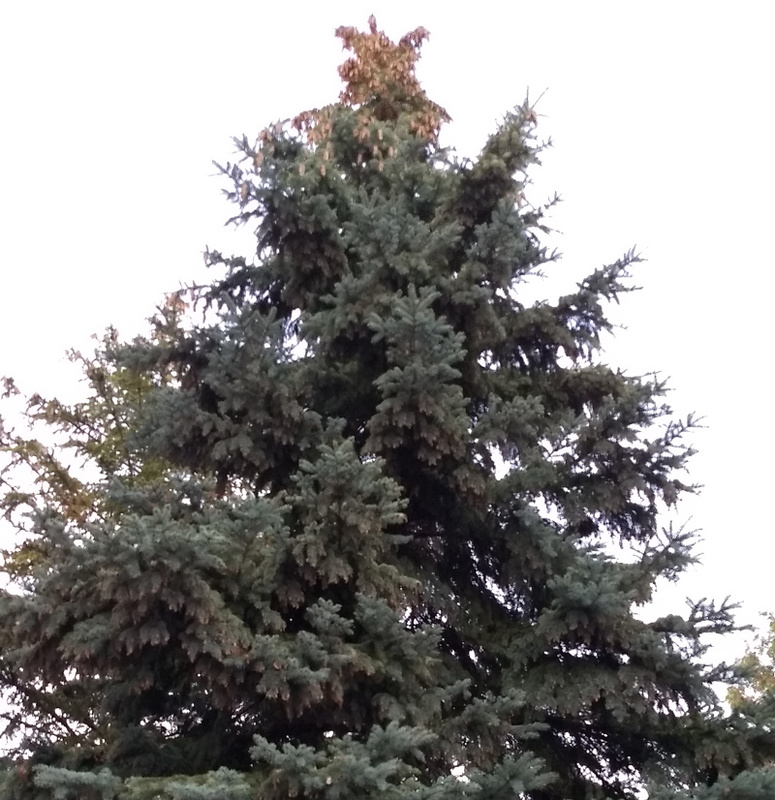 This is an example of a Spruce tree laden with cones only at the top of the tree. According to my grand parents on my mother's side, this means a rough winter coming up where I live. Depending on your location, we are getting close to the time of year when previous years work will pay off. Most harvests are in the fall, but a couple of my favorites are in the spring. Asparagus and Stinging Nettle greens are my two favorite early season harvests. This time of year having fresh greens from the garden is very welcome and it's a real treat that they both taste so good. 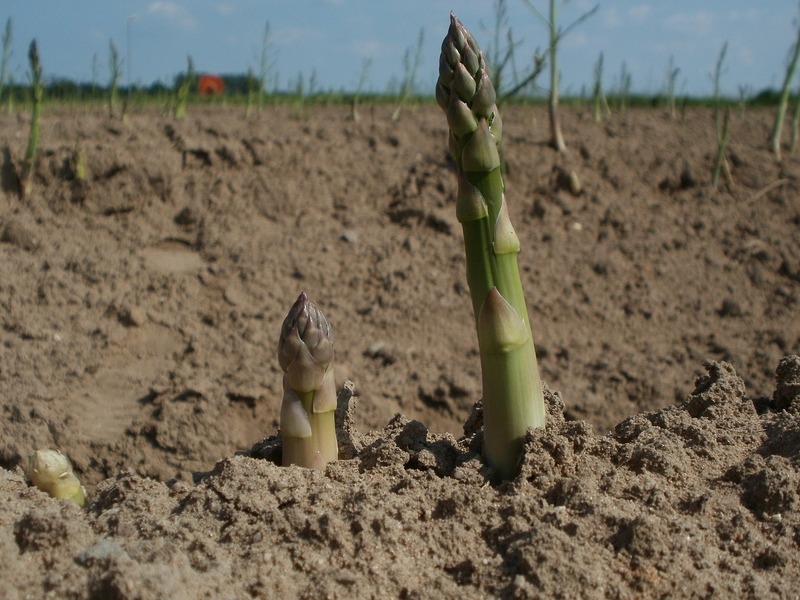 See the pages for Asparagus and Stinging Nettle greens for details on harvesting. 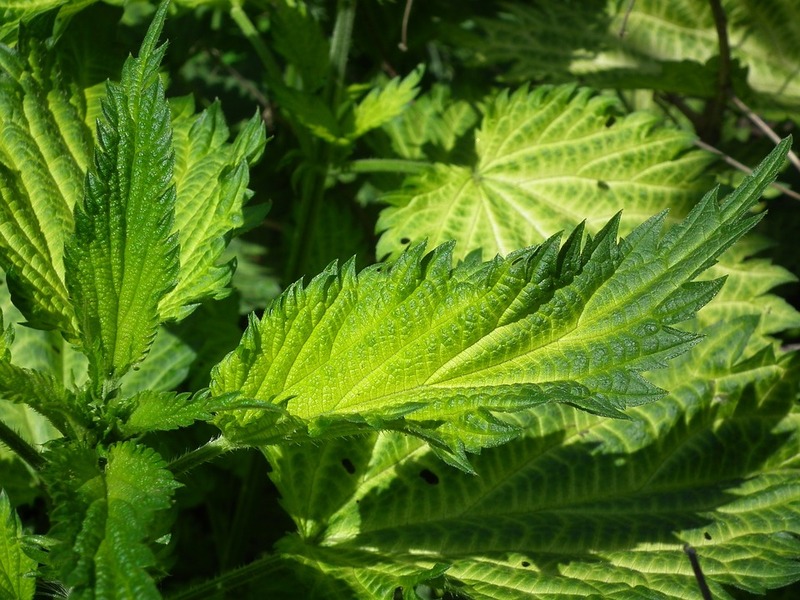 As soon as I get the first crop of Stinging Nettles, I'm going to post a couple of recipes in the Recipes section. Enjoy! There are two new sections on this site. One is Articles where I, and hopefully others, contribute How-To articles for Wild Food gardening and gardening in general. The link is on the top bar of each page and on the Contents Page. If you would like to contribute articles, please read the paragraph about contributing under the articles on the Articles page. The next is Recipes. This is where I'm going to put recipes that contain, or are all Wild Food based. I have a few to add, and will do so as I make them and document them with pictures. If the ground is not frozen where you live, this is a great time of year for transplanting shrubs, trees and some plants. The plants are dormant right now, you don't have to worry about the ground drying out and the bugs are nowhere to be found. Also, as the ground goes through freeze/thaw cycles during the winter, the soil compacts properly around the roots creating the right conditions for the roots to be able to draw moisture from the ground when spring comes. This can make a big difference to increase the survival chance of the plant, tree or shrub. The problem with this time of year is it can be hard to identify shrubs and trees, and even to find most plants. If however, you have done that work earlier in the year, and made a map where they are with some form of identifying system (twist tie or cable tie on a branch, or stake in the ground), you are good to go. It has been a bit since I've posted an entry here. I've been working hard to make significant changes to the site based on both feedback and my own changing ideas of how to make it better. One of the changes is the adding of a lot of pictures. The the other change is having links in the descriptions go to pages on this site instead of outside. When I would ask people what they thought would be an improvement to the site, the most common answer was, "why are there not more pictures to help identify each plant"? My answer used to be along the lines of it makes the site faster to load without pictures and besides, there is the link in each description to pictures on the web. However, when people were kind enough to be honest they would tell me that they found the sorting out of the pictures on the web frustrating and confusing. Added to that, the web is faster than it was when the site first came out, so it was time to update with pictures that would be useful. I haven't fully finished the process, and probably never will. However, it has reached a point where most of the plants have enough pictures to aid with identification. I have to admit the process of doing this was far more work than I thought it would be, so it took weeks instead of days. Anyway, hope the changes really do help. The other change as mentioned is making more links in the description section of each page go to an internal link instead of external. Let me give you an example. Up to the last few days, if you were to click on the highlighted word "margins" in the leaf description, you would be taken to a Wikipedia page for a description and pictures of leaf margins. Now, when you click on "margins" you are taken to the identification page on this site, and down to a image chart showing the different types of leaf margins and what they are called. I did this for a few reasons, by the main on was simplicity. I find Wikipedia descriptions too technical in some cases for someone not familiar with the terms, and besides, seeing an image chart is so very straightforward. This way I can tailor the content to what is needed in each case instead of just hoping some outside link does the trick. I've made this change to a lot of links, and the process is continuing. My goal is to have most links for descriptions and learning internal, and keep external links only when it is truly is the best option. That way I can control the content and keep it clear as opposed to technical. I was just having an e-mail conversation, and I decided to include the gist of it in this journal entry. In a way, it has a tangential relationship to gardening. I'm older now, and hopefully when you get older, you can look back and put bits and pieces of your life into sensible blocks that give them meaning. When I look back, I realize now I made a fundamental mistake in what I paid attention to in my life. For the purpose of this argument, I see two broad categories. One is "stuff" or inanimate things, and the other is living things. I spent a lot of time with the stuff in my life. Working on stuff, collecting stuff, fixing stuff, moving stuff, thinking about and shopping for stuff, worrying about losing my stuff or having it rot, rust, melt or fade. I regret it now. I wish I had taken a lot of that time (and money) and spent it with (and on) living things. Mainly the cats and people in my life, but also with plants, trees, etc. This has been reinforced by looking back through both my digital picture collection which starts in the year 2000 conveniently, and the film pictures which goes from 1999 to waaaay back. I flip through the pictures of the stuff and think, oh yeah, I remember that and flip to the next picture, but when I see a person or cat from the past, I stop, look and remember. The only time stuff makes me stop is when it is associated with a living thing that takes me back. At one time I didn't see such a dividing line between the living and non-living. I knew the difference, could see it, but it never occurred to me there was such a huge difference in value - I gave stuff way too much attention when I should have spent that attention elsewhere. I don't blame myself, I grew up a what could easily be described as the most materialistic culture there ever has been, and I'm glad I figured this out before my last breath. I can't go back and change that past, but the effect it has had on me is profound: less time devoted to stuff, and focus on living things. Well, OK, there is a point. Not an original one though. It is: Home made items carry with them a quality that you cannot get by just spending money for a factory item, and this includes home-grown food. Somehow, someway, it's just better than store bought. I was going through my hundreds and hundreds of pictures I've taken with digital cameras today, and came across a picture I could not find for the life of me a couple of weeks ago. Yet today, I just stumbled across it. Isn't that just like life? Looking at this picture made me think of how I could live on almost no money when I lived in a Cedar Log Cabin in the woods of Central Ontario for 5 years. If you are interested, you can read about that time here. 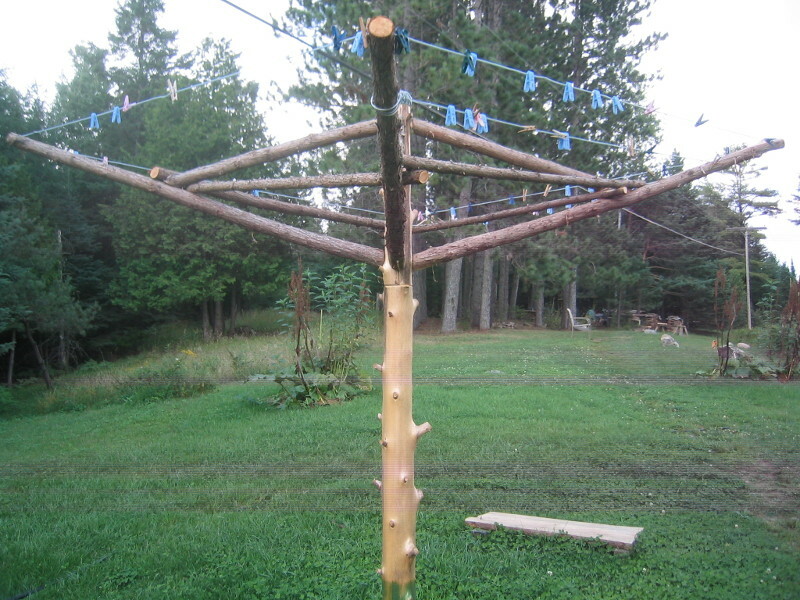 When some people saw my home made clothesline, they laughed uncontrollably. Some were fascinated like they just saw a new kind of life form. One day I heard a knock at my door. A woman and her son were coming from Toronto and going to their cottage on one of the local lakes, and happened to see the cloths line from the road as they passed. She said she just had to look at it up close. She was just taken with it and studied it intently. She asked if she could take pictures. I said sure, go ahead. After about 10 shots from about the same number of angles, she asked if I would be willing to stand beside it for a picture. I wasn't so sure about this for reasons of being embarrassed about being "poor", but thought, meh, why not? Now I look at the clothesline pictures and think of how if it had been a standard one from the store, nobody would have cared and dropped in to see it. How many times do total strangers drop in to see a store bought clothesline? Bet not a lot. Funny how the best things in life are those that you take the time to make even if the reasons having nothing to do with the great feel that comes from them in the end. Gardening food is like that. Even if you are "just growing food", the quality is just nicer than anything that comes from a grocery store. I call this picture, "Clothesline in August". Seems to just about tick all the boxes. Oh yes, the board on the ground is where I would set the basket so it wouldn't get covered with dirt on the bottom. And yes, it would spin around. Based on feedback, and spending time reading about how to make a website more user friendly, I've made a significant change in how the site works. Up to now, most times when you clicked on a link, it opened in a new tab. I was told this was not user friendly, so the change has been made. From now on, when you click on a link, it opens in the same page you are on. To go back to the page you were on, just click the "Back" button on your browser. Thank you to those that took their time to let me know their preference. If there is anything else you would like me to change with the site, let me know. I spend so much time working on it, I can't see it objectively anymore, and really appreciate feedback and comments. I'm not a web specialist, but I'm learning quickly on the job! From my experience the worst "weed" in general is grass in the garden. Many types, all a pain. Though I must say, when I lived in Central Ontario in a Cedar Log Cabin, there were Bracken Fern that were just unbelievable. They were all over my yard, and every morning, there would be numerous 2 or 3 inch tall Bracken Fern coming up in the garden. They spread by very thick, pitch black runners that were a few inches under the surface that were nearly impossible to eradicate, and spread so fast from outside the garden it was hard to comprehend. If you chopped them up with a tiller, they would re-sprout from each piece. I'm not quite sure why they haven't completely covered the land surface of the earth by now. All that said, many things most people pull out, you can just leave and reclassify. Stop calling them weeds, and refer to them as what they are. Some of the best that seem to come up in most gardens I've had are: Lamb's Quarters, Green Amaranth, Purslane, Dandelion and Shepherd's Purse. Unless they are choking something out you want, they are just great free food plants. As I said in the Lamb's Quarters section, I've stopped growing Spinach now. Lamb's Quarters are closely related and taste as good or better (cooked or raw). But the reason I grow them instead of spinach (or more accurately - let them stay where they come up) is they are far more hardy than spinach. Much, much easier to grow. The only downside is the leaves are smaller, so a bit more time picking, but that is a small price to pay for a plant that just takes care of itself. Green Amaranth, though not my favorite green, is not bad in small amounts in cooked food. But, I don't let them stay for that reason. I love the grain they produce in baked foods. They will only sprout from seed in the soil when it gets hot. I think they need the soil to reach about 80 degrees F. before they will sprout. Where I live, this means they don't even show until late June to July. By the time they get large, it is August. This works very well if you intentionally plant them, or let them grow, where spring plants have basically finished by that time. Peas and leaf lettuce come to mind. If you are a corn or soy farmer, please don't read any more of this sentence, but I've mixed lettuce and Green Amaranth seed, and planted them in the same plot section in the early spring. Lettuce come up quickly and early in the cool weather, then by the time they are nearly finished, the Green Amaranth comes up. By fall, I'm gathering good amounts of Green Amaranth grain. By the way, you only need to do this once, as the Green Amaranth will have made that spot home and come up every year, as you will never, ever be able to stop some of the grain/seed from falling to the ground. Purslane. I absolutely love Purslane greens. Raw in salads, they are fantastic. Tasty, lemony, crunchy and nutritious. Oh, and nice looking in salads. In India they are a major food crop used raw and cooked, here we pull and compost them. Nuts. Totally nuts. They can tolerate drought like little else without wilting. They respond well to pampering by giving monster size crops, but if you just ignore them, and let them grow in dust, you still get good food. They tend to stay low, and I've never seen them cause something they are growing between to be negatively affected by them - they have good garden manners for a plant. Let them stay, harvest them all season, and let them flower and drop the seeds later in the year. If you cook them, they tend to have a similar effect on the cooked meal that Okra has - a thickener. Honestly, not my thing, but a great substitute for home grown Okra if you live too far north to grow Okra consistently. Dandelion. I won't go into them too much, other than to say, just use the greens from the ones that pop up in your garden rather than lawn grown ones. I don't know why, but they are less bitter. Once Dandelions have been mowed a time or two and start growing low to the ground, they get far more bitter. In the fall pull out the roots, wash well, chop up, dry in a food dryer or oven, put in jars and use a tiny bit in soups, or for making coffee. Yes, really. See the Dandelion section for my explanation of this. I have not missed a day with Dandelion, Chicory and Burdock in my coffee or tea for many years. Shepherd's Purse are so thin and wispy, they never block the light to other plants, they come up a few times per season. That's right - they sprout, mature, drop seeds and those seeds sprout, and on and on a few times per season. Use the fresh greens in just about anything, and the roots, though not much to speak of, are not bad at all in almost any type of meal. In fact in Korea, Shepherd's Purse roots are a common food crop. My mixed conventional and wild food garden in Central Ontario in the Summer of 2010. I was cleaning and organizing my shed for the winter yesterday. Taking the snow shovels from the back of the shed and putting them in the garage, cleaning and reorganizing. As I was working away, I realized the shed didn't have much life left in it. Floor is rotting and is raised on one side from frost, walls have water stains on them, roof needs redoing yet again, wood on the outside is getting so rotted, I think the only thing holding it together is just habit. I remember my father building the shed decades ago. He wasn't happy about doing it. My mom wanted a flat roof and sides that came up past the roof line to make it look like it was part of a high fence when looking from the road. My father kept saying flat roofs and wooden buildings don't go together and it would end up rotting away. Well, he was right. I never liked the shed anyway. I don't like things that are trying to look like something they are not. A fence should look like a fence and a shed should look like a shed - a shed should never try to look like a fence. So this started me thinking about what I like when I see a garden shed. For me, it's something that takes me to a place in my mind where gardening is a magical place. Something like we can imagine gardening to be long ago on a country family farm. I'm sure the reality was never like that, but I like when things at least take you there in your mind. Maybe life cannot ever be ideal, but if we hold to that ideal, maybe we will get closer to it than if we just give up before we start. What is that magical ideal for me when it comes to a garden shed? There are many I have seen in magazines and on the web, but I also found it in the picture below I took while at a gift & craft store in Sparta, Ontario called Winter Wheat. Oh well, at least the shed I have keeps the snow out - so far. Shed at Winter Wheat store in Sparta, Ontario. This is the season of harvest, but I want to start this Journal with what has been on my mind regarding wild food gardening. We are coming up to the best time of the year for transplanting many plants, trees & shrubs. Once the plants go dormant, we have a great opportunity to move them with the greatest chance of their survival. Right now is too early to do the actual moving, but we are at the best time for getting things ready. Planning what you are going to move, and where you are going to plant it lets you just go ahead and do the physical work when the time is right. I like to transplant in early November. For one thing, you are sure the plant is dormant unless you live very far south. Another advantage is you don't have to worry about the plant or soil drying out. Another reason you have to think of this now is some plants are hard to find and identify after a frost. I have found a great patch of Stinging Nettles that I want to move, and have staked them so I know where to dig when November comes. Identify the plant when the leaves are on, tag it somehow and when you come back to move it, you know for sure it is what you want. I have never had a stake pulled or a tag removed in all the years I've done this. Mind you, I'm very careful to only take plants from where it is legal and nobody would possibly care. This is also the time of year to begin gathering seeds and nuts for planting and creating your own wild food garden at home. Read the page pertaining to the plant before beginning as there are exceptions, but in most cases it is a matter of gathering, marking and storing. One plant I'm gathering seeds for right now is Burdock. I really love the taste of Burdock roots in soups, coffee (yes, really - read the Burdock root page) and baked casseroles. Gathering Burdock seeds can be a pain as they stick to everything, but one of the best ways is to take an empty plastic container like a yogurt container with you, put it over the burrs (seeds) and cut off the burrs that fit in the container, turn it over and put the lid on and take home. You can plant the thin, black seeds when you get home. Space them well and cover with an inch or so of soil, tamp down and leave. You will need sandy loam or soft, deep soil to get roots that are not branched and stringy. Do it right, and you will get nice straight, long roots up to as thick as a thumb.